MilkPrice: Where are Class III prices going? On May 1, the new Class III milk component prices will be announced. Where are they headed? Let's review the underlying data that influences the pricing. Protein pricing is calculated from this equation. Similarly, Butterfat pricing is calculated from this equation. The actual calculation uses the National Agricultural Statistical Services (NASS) cheese and butter prices which lag the Chicago Mercantile Exchange (CME) prices by about two weeks (April 2 post to this blog). However, we'll look at the CME prices as they are made available on a timelier basis. 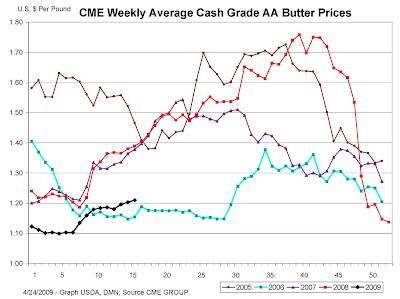 Butter prices are clearly up, so we can expect an improvement in butterfat pricing. Where are cheese and protein prices going? Cheese prices have taken a downward tumble. With Cheese prices down and butter prices up, we can expect protein to be down for April. 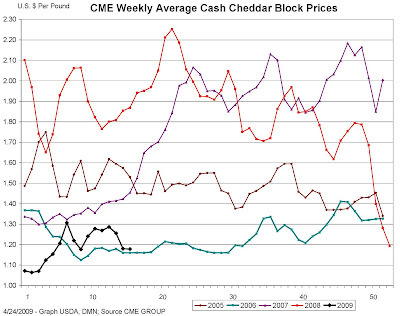 Cheese prices are down and dominate the Class III formulas, so there is no doubt that Class III will be down for April. Not good news. Monday's post will review the actual Class III prices that will be announced on Friday and their impact on the long term trends. 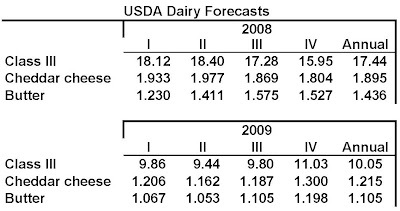 What does the USDA forecast for 2009? Even posting it is painful!